Shinto shrines are covered in pieces of paper, often zigzag strips of paper. They hang from the rice straw ropes （shimenawa 注連縄） that mark a sacred site. They are attached to the sacred branches that people give as an offering in Shinto ceremonies (tamagushi 玉串). They are used as a tool for purification, when swung to and fro in bulk at the end of a wand　（大幣/祓い串). They stand next to mirrors at shrines as gohei(御幣）. In addition the the zig zag strips however, there are other pieces of paper that Shrines give out, specifically the pieces of paper that people take home to put in their household shrines (ofudaお札）, and the pieces of paper that are contained inside Shinto lucky charms (omamoriお守り). However, in many case, as Yanagita (1990) bewails, the same things are at once offerings to the gods (like money today) and invested of, containing the gods themselves (note 1). It seems to me that essentially they are all the same, the vector for the sacred symbols of Shinto: the offerings which start out as simply pieces of paper become sacred as a result of their use as symbols. When they are in their zig-zag form, the form which is usually given to shrines, they have yet to have been cut or torn into their individual form for distribution to worshippers as sacred tags (fuda札) or lucky charms (omamori). This video shows you how to make the zigzag strips and how I propose they were originally used, to create strips of paper for distribution to the faithful. There is strong evidence to suggest that these strips of paper evolved from the use of branches, leaves, and grass as is recorded in the ethnology of Kunio Yanagita(1990), and as is suggested by the form of the tamagushi, which like the composite forms recorded by Yanagita, may be the old form of the Shinto symbol (a branch with leaves) combined with new (the zig zag strips shown in this video). For ethnographic evidence that these strips of paper were once branches and leaves, and that they were distributed, please notes in Japanese at the bottom of this post. Bearing in mind the natural origins of Shinto symbols, I think that Shinto can be interpreted as a form of totemism, that is to say, a religion that values, structures, distributes a certain type of sign. Levi-Strauss (1966) redefined totemism as "bricolage," (DIY) or "the science of the concrete": the use of things to hand, things in the world to signify their gods *and themselves*. The importance of this observation is that it provides a hint to a non-logocentric (i.e. hearing yourself speak) form of self. The problem with this interpretation is that, while Levi-Strauss(1966) concentrates on the use of natural articles for thought, he does mention the use of manufactured articles (such as gourds) used as totems, and even mythical articles (mythical creatures) used for totems. This considered, the distinction between "savage thought" and Western thought (using mental images of phonemes) becomes very vague. If Shinto is a form of totemism then it has moved beyond using solely natural articles to using seals printed on pieces of paper. In what sense if any are such symbols "concrete" or part of the world any more than phonemes are part of the world? I suggest that these symbols, that are organised, distributed and valued by the Shinto religion are above all visual, understood by the eye rather than ear of the mind. That visual signs can mean by themselves without the vector of the phoneme is argued persuasively by Hansen (1993) but runs directly against the Western tradition (Barthes, 1977) and is attacked vociferously by scholars such as Unger (1990). That Japanese may have used branches, leaves, and grass as important religious symbols may be the reason why they are recorded as saying things in the "Collection of Ten Thousand Leaves" (Manyoushu) and why, as recorded in the same book, as a result of the imperial government being so effectively organised (and I suggest the use of paper and ideograms) that the same trees and grass stopped saying things. I need to find those two poems. Which may mean something like. To all the wild spirits throughout the land, impeaching them and sweeping them away, the rocks and trees and the leaves of grass that before called out to us, stopped speaking, when (and) the imperial ancestors left the rock of heaven and parting the clouds came down from heaven. By performing the purification ritual (which these days is accompanied by a lot of waving of paper, but in those days seemed to use tablets or pieces of wood that are washed away in a river) the ancient Japanese felt that their ritual provided by the new imperial system enabled them to rid of their wild spirits, and prevent the rocks, trees, and grass from speaking despite the fact that they had done so hithertoo. I argue that what we are seeing here is the gradual transformation (or subjugation) of a purely natural science of the concrete (totemism), wherein rocks, trees and grass where used as symbols - hence the spoke - into a ritualistically structured legal, political religious system eventually using Chinese characters stamped on pieces of wood, cloth and paper. By way of analogy imagine if some deposed EU bureaucrats from Brussels, went to live with the Nuer (as studied by Evans-Prichard, 1940), and rather than converting them to Christianity, ordered and persuaded the Nuer to formalise their belief system. "No, there is no need to cut scars into your face any more. Please use these ID cards instead. Don't worry, the same information will be contained in the bar-code here. Yes, the bar-code reader will be available at all marriages and festivals." And so the science of the concrete evolved, but it did not become logo-phoocentric (Derrida), or alphabetical (Hansen, 1993). Unger, J. M. (1990). The Very Idea. The Notion of Ideogram in China and Japan. Monumenta Nipponica, 45(4), 391--411. Yamada, T. (n.d.). Shinto Symbols. Contemporary Religions in Japan, 7(2), 89--142. Yanagita, K.　柳田国男. (1990). 神樹篇-柳 田国男全集. On the one hand these things (natural or strips of paper) are things that are given to shrines somewhat like money is today, and at the same time are things that the deities are said to possess (such as fuda, which are containers of spirit). At some point in their history, as argued in the video above, the transition from mere offering or artefact to vessel of the sacred may have been achieved by stamping pieces of paper with a shrine seal but it is not the stamp that is important, rather the way that the artefact is used. A branch from a special tree given to a shrine may be just a branch. Leaves from the same branch given to worshippers can be symbols signifying group membership, the ability to marry (see recent post on other types of "omamori"), and identity. By their symbolic function they are transformed from mere leaves to very special things. That this distribution of strips of paper is not only in the paper form but also in the natural form. Prior to the use of paper, things made out of trees and their bark were used, and before that branches and grass were used as is. 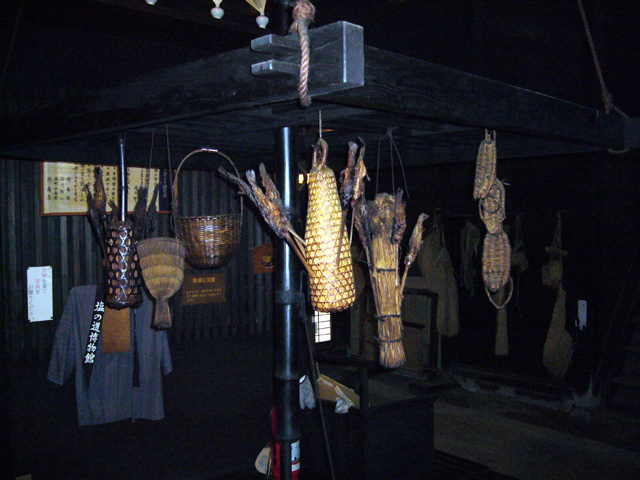 These strips that hang from shimenawa are called Shide (or hanging-down things) but Yanagita suggests that they originated in a word for flora. 213 Process of using man made things instead of natural articles. This is one step away from the bricoleur who uses natural things as symbols, but it is a symbolism that is still using things as symbols.